Greetings, my lower latitudinous friends! It finally dawned on me how the definition of the term “wiped” was coined…. because after this relay of ricochets (not so minor even on a global scale), I feel as if someone took me and “wiped” half of JFK airport with me. However, although most of my body is displaying the stiffness level and vital statistics of a wet pretzel, I am still somehow managing to tap these keys with the end of my plastic fork which I kept as a memento from one of my flights. So, what day is it anyway? Well, I think it’s what some of the world would call Monday. The reason for my slight confusion, aside from my partial coach-class coma, is the fact that although it is 3:00a in the morning, the sun is still doing its thing – namely shedding light. 22-hour days now, until……. that very special date – April 19th. But herein lies some additional confusion. You see, April 19th is Sunday. I know, as you’re taking a quick glance at your wall calendars, you’re quietly chuckling to yourselves at my faux pas, but it’s no mistake (my hair-color notwithstanding). So, just quit snickering and keep up with me. It’s only my body that’s “wiped”; the Info-Tech core is still quite viable and blinking brightly. Therefore, to help clear out your cranial fog about calendars within the confines of the Arctic Circle – more specifically in Longyearbyen, Svalbard where I am currently ensconced, allow me to continue with my lesson. As I was saying, no matter on which day of the week it happens to fall (even Monday as the case may be in 2004), the 19th day of April will always be Sun-day. Let me repeat: SUN-day. 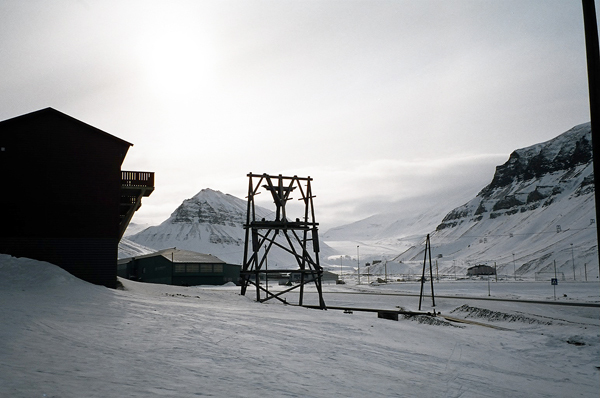 That is the first day in the Longyearbyenean year (say THAT 10 times fast) that the sun comes up and never sets. It remains above the horizon, yes, continuously, from April 19th to August 23rd. Talk about a city that never sleeps! Well, technically, or rather theoretically, they don’t sleep until the opposite phenomenon demands equal time, thus the 24-hour night for the same duration. That’s plenty of time for one… big… party! Well, that’ll be it for this episode. I’d better make an attempt to catch some shut-eye before I head out into the Wide White World in search of some mushin’ huskies who won’t mind pulling me and my sled. Why does a compass – a regular plain ol’ floating/spinning magnetized needle on a pin compass (not an electronic or GPS one) – work less and less accurately as one approaches the North Pole? Same question paraphrased: Why does a compass NOT work near or at the pole itself? The answer is very simple, straightforward, and rather unscientific, and yet only one person I’ve asked could give me the correct answer right away. So, get crackin’! Start your research…. while I think up a prize. Greetings to those of you NOT experiencing minus 7 degrees C.
I’m almost afraid to mention anything about the local weather so as not to tempt the North Wind to return with its fury. Apparently, the conditions here had been so severe the last week, that most activities had been cancelled – yes, even Easter celebrations. But as of my arrival: all quiet on the northern front. The locals are quick with snow removal, and had I not heard the stories, I might never have believed how nasty the blizzards had been. However, even with fresh snow on the ground, it is still more than disconcerting to see so much open water. The locations where I had walked safely on the ice last year are black, black abysses with huge blocks of ice and bergie bits (yes, it’s a REAL term for small icebergs) floating freely on and beneath the surface. I’ve already been out the better part of the morning (did about 6 or 7 kilometers of brisk hiking) scoping out things with which to occupy my time while awaiting Tuesday. That’s the big day. Don’t forget that the days here are now very long, and I begin tomorrow with a 3-hour dog-sled ride into the mountains and up the glacier to where the ice caves are currently open and wide enough to meander through. I figure about 2-hours of bright blue refrigeration within the glacier’s eerie echoing and groaning passages might suffice, and then 3-hours back to Longyearbyen with my dog team… Then some Arctic char tartar (Arctic char should be officially classified as the most delicious fish in the world) for lunch. Some light meditation after the meal to keep my adrenalin in check because at 14:00, Borge arrives (question is: how do I perform CPR on myself?). Exhausted as I was, the excitement of this impending adventure had managed to keep me fired up and awake enough to observe the wonders of our planet from 37,000 feet. After leaving Tromso (very northern Scandinavia) through a minor blizzard, once we got above the clouds, the sky was a like a painting awaiting a canvas. There is nothing like the light from the never-setting sun which sits just on the horizon itself. The sky is in a perpetual sunset mode, the pastel colors pale and gentle as they blend one into another. It’s almost like flying through a faint rainbow. After awhile, the clouds below which seemed to be in dire need of some styling mousse began to thin. Nothing but sky and water…. and then a lone island as if lost in time. Nothing on it but snow. 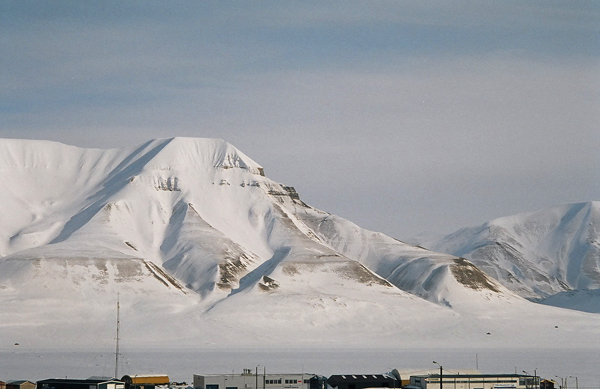 This is, ironically, an oasis for the travelling polar bear – hence its name: Bear Island. 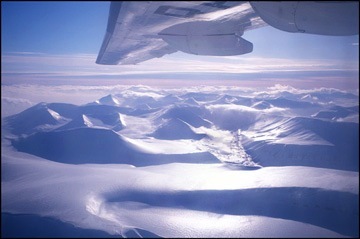 Soon enough the points of Svalbard’s mountains came into view. Well, it’s no wonder the plane flew in a slightly lop-sided manner, for every passenger was plastered to the left side of it to look. Seat belts? What seat belts? Seat belts are for sissies! So, what’s a couple of bruises if you can treat your eyes to such a vision? But… rules are rules, and the flight attendants insisted that we all partake of our seats in preparation for landing – or something resembling that…..
OK, I’ve flown on many planes. Since early childhood. I LIKE planes. So much so that I pursued flight instructions, and have even been seen frequenting a Navion 226’s co-pilot’s chair with yoke in hand. But, the maneuver I experienced (and lived through I am happy to say) as a passenger on approach to Longyearbyen airport has prompted me to post an APB (All Points Bulletin) on the whereabouts of my trusty ticker. It did its own version of the tango! Oh, it must still be in there somewhere because the blood is still flowing through my veins, but it’s probably cowering under my spleen. Whew! What a landing that was…… I am quite certain that there was not just one pair of skivvies in need of changing. And the pilot, whose name no doubt is Evilsven Kenievalsjornssen, with a sparkle in his eye, actually said, “It’s all in a day’s work.” Well, not MY work, thank you, kind Sir. I’ll just stick to slightly more accessible landing strips myself, such as, oh… Broadway in downtown Manhattan! Eh, but we are Vikings at heart, and we take this kinda stuff at stride. Right? Damn straight!!!! Alright, it’s parka time again! I didn’t travel all this way to be sittin’ in front of my laptop, you know. So, you’ll kindly excuse me while I go work up my arctic char appetite. It’s back out of doors for this husky (no comments from the peanut gallery, please)! The Ice is calling…. again. “I’M COMING!!!!! !” As you can see, I gotta teach this Ice some proper polar etiquette….. So, would you like some bergie bits for your Pepsi? Hey, no prob. It’ll give me something different to do. And I also have to disappoint my North (hm…) Salemite neighbor whose response was somewhat peripheral: stating that it’s because the compass was made by Iraqi insurgents, or… by the French (tongue-in-cheek, I’m sure). [Not to worry, Goober, your identity is labeled as “classified” so as not to instigate any foreign retaliation.] You are indeed funny, yet wrong. Some of the compass answers were esoteric, some zen-like, some very educated, and still others got pretty close to being correct, but as I said, the answer was more mechanical – having relatively little to do with the actual physics of Earth’s magnetism. But I will offer to carry some of the blame for not asking the question as specifically as perhaps I should have. Yes, ’tis true that the geographic and magnetic poles are in two completely different locations (Magnetic North is just north of Canada currently). And yes, the magnetic pole does move by what is called magnetic longitudinal deviation. But my question was: Why does a compass become less and less accurate as you APPROACH the pole, eventually rendering it almost unusable? A funnier way of looking at it is with the following query: By just looking at a compass, how can you tell whether or not it’s been used close to the magnetic North Pole? Well…. ladies and gents, it’s all quite as Homer Simpson would put it: “DOH!” If you look at a spin compass that was used near the pole, there will be circle of paint scratched out on the bed of the compass case. See, because the one tip of the needle which is magnetized begins to be pulled downward more and more toward the center of the earth as you get closer to the magnetic pole, eventually, it just stops floating freely altogether and literally drags itself along the bottom. If you tilt the compass so that the needle doesn’t scrape the case floor, it kinda defeats the purpose of using it in the first place. So, like I said before, and everyone in unison: “DOH!” This is why we all rely on modern conveniences such as GPS. Right where I am now, and as it was at the pole itself last year, my GPS immediately hooked into at least 14 satellites!!! Not much room for error here. Accuracy is to within one meter! But I sure do miss my spinning needle….. Round and round she goes….. Whenever I go to any unusual or far-off places, I often get requests for unusual souvenirs – more often than not – rocks. I, myself, have quite a collection, although not all procured by self – one from the summit of Mt. Everest, one from Antarctica, one from Mt. St. Helens’ caldera rim to mention a few. But when, last year, a number of seemingly intelligent people asked me to bring rocks back from the North Pole, I had to do everything I could to suppress the desire to smack them upside the head for not paying attention in geography class that day. “Um, hello? Unlike Antarctica, there is no land mass up at the top of our planet. 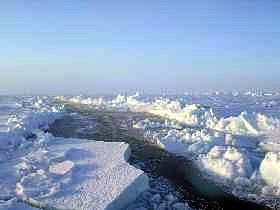 It’s just frozen ocean.” The closest land is the very northern tip of Greenland, then there is a small Siberian island, and of course, there is Svalbard. So, while I am here, I can collect a rock or two, or three or four… Actually, there isn’t much else that I COULD bring back (sorry, Larry dear, no snowballs – although…. nah, never mind.). 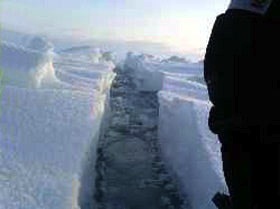 However, it’s not a simple task to locate small stones under all this white stuff. Either you have to dig down under the hardened snow and layers of ice, and then ice-pick at the rock, or you have to climb halfway up some slippery mountain side. Well, should I try? Nope…. Since I possess a mild streak of an opportunist and scavenger, I will not opt for testing the sound barrier with an involuntary shoosh down a 55-degree or better slope on my proverbial personal ’sofa’. But as luck would have it, on my way back from the sled-dog parking area and adjoining kennel where I carefully chose my team of huskies, BINGO! There it is! A small handful of lone rocks! Yes, this’ll do! So, the dedicated soul that I am to my wanting friends, not even the blustery blinding wind could stop me from collecting my prize of Svalbardian souvenirs. I quickly absconded with them, threw them in a little baggie which I keep in my pocket for just such opportunities, and off I went, happy as can be that I would please my buddies at home. I even “stole” a few for my own shelf. Once safely back in the lodge, and having treated myself to some more yummy char, I decided that I should see if I could deduce some geological phenomena from my artifacts. I unzipped the baggie, which by this time had thawed thoroughly, and…. nearly fainted from the eh… shall we call it aroma? OK, I’ll give you a minute…..
And I leave you with that lovely mental image…. But tomorrow, folks, I will not, and I repeat NOT be collecting ANYTHING! For ANYBODY! I don’t care how much you like me, or think that I like YOU, but that was one episode I do not care to repeat! GOT THAT?!?!?!? Rock-shmocks! Just get your own next time! Well, this will be my last Email from Svalbard. Tomorrow I fly back to Reykjavik. Oh, quit feeling sorry for me. It’s not ALL bad… Yes, mind you, I would love to stay for weeks more, or even months, but there are those pesky things in life which we call responsibilities. And all good things must come to an end, even for dreamers such as I who has thusly been booked, charged and found guilty. Just in the last 24 hours, I’ve had so many ups and downs that I am feeling downright woozie. Some of them REALLY good, and some of them a bit frightening. But out here, fear gives us cause to have much more respect for the elements and the power of nature itself. We are, after all, puny little visitors on this planet, and while we are here, we are at its mercy – like it or not… It matters not how famous one is in social circles; Mother Nature will never be accused of favoritism. Allow me to briefly wax sentimental. Just as Borge Ousland is a polar god to me, there is another man whom I have equally admired since I learned of him and his feats only a few years ago. He is one of the, if not THE most prominent explorer in the world today. As a matter of fact, in order to immerse myself as much as possible into this adventure of mine, I purchased a copy of his book to read before I left home. It is called “Mind Over Matter”. It is an autobiographical volume about his expedition across Antarctica. This man is more than an expert on the subject of polar travel and discovery and firsts. He has done more than Borge, but only because he has more years under his belt than Borge, at least a dozen, I’d say. In any case, I have followed his latest exploits to varying degrees, and even display an autographed photo of him on my “polar shelf”. It’s inspirational to me in all matters of life, not just in Arctic and Antarctic exploration. Last evening, as I was enjoying my dinner of…. yup, char – yet again… I was deep in thought contemplating the scope of madness required for the Last Degree Expedition this year, the room rather full of people, and I sitting at a table of four – alone. I was in somewhat of a daze when someone tapped my shoulder to ask if they could “share” my table as there was no other place for them to sit. Naturally, I agreed with nary a thought to the contrary. I collected my things from the chair next to me, and one of the two English-accented chaps sat down beside me. Well……. it didn’t take long for me to be literally BESIDE myself as well. It was practically an out of body experience!!!! I had to have pinched myself at least 30 times to make sure I wasn’t dreaming. I’m not even sure if I hadn’t made a fool of myself during those first few minutes that my heart stopped! No, it wasn’t Borge. It was Ranulph Fiennes. More correctly, SIR Ranulph Fiennes. The very man whom I had described in the previous paragraph above!!!!!!!!! Ohmigoshohmigoshohmigosh!!!!!! I knew from a former North Pole fellow expeditioner that Sir Fiennes was planning on running in the second North Pole Marathon, which was to be held on the 10th (at the pole, obviously), but what were the chances of meeting up with him in Longyearbyen, and on the same day that I happened to be here myself? This was not to be believed. I mean, how lucky could I get? Ranulph had finished the marathon at the pole ( http://www.npmarathon.com ) 2 days before – in second place I might add, after having had by-pass surgery only months ago – and had just returned to Svalbard from where he’d continue on to Great Britain the following day. I don’t remember much of the conversation because I was barely able to contain myself. It’s a good thing I have good bladder control…. In any case, the discussion eventually meandered its way to the conditions of the Ice. Ranulph knew about many of the expeditions which had been out for the last month and a half, and he knew about the ones leaving imminently. When I asked him for his opinion on what the future holds, specifically expeditions leaving in the next day or two, he did not say much at all. But what he did was hold up his left hand. You see, even someone as experienced as Sir Fiennes has fallen victim to polar conditions. Even he is not immune to frostbite severe enough to have lost fingers (years before). Well, his silent answer was more than clear…. A few members of Borge’s team had already opted out yesterday. What the rest will do shall be decided tonight. Of a Polish team, one man will never return. He is gone forever. As is a woman attempting to be the first female to accomplish Borge’s feat of 1994. She, Dominick Arduin, is missing and presumed dead as of March 5-th. Wave Vidmar is still dragging himself to the pole with a broken ankle because he doesn’t want to quit, but success for him is questionable. Frederic fell into a lead and needed to be rescued. That occurred at the beginning of March. He is still in the hospital. Ben Saunders, as far as I know, is still trudging along the route of his 1,240 mile “hike”, but having to actually swim across many leads in a dry suit! This is no joke out here. And believe it or not, the reason for the heightened danger this year is the fact that it is too WARM. 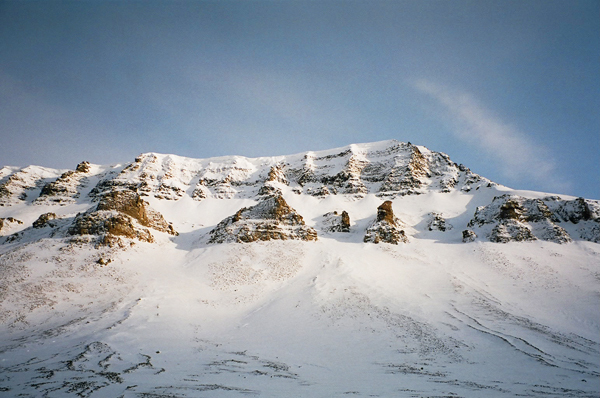 For expeditions to be safest, the temperatures should hover near and around minus 30. It has been minus 10 on the average, and here in Svalbard, even though it didn’t last long, it briefly hit minus 3 early this morning. Hence all the open water, the cracking ice, and the widening leads. Global warming be damned! There are no complimentary miniature Swiss chocolates on pillows out here. Heck, there aren’t even any pillows. It’s only each one of us for ourselves. No one here makes decisions lightly, for if they do, they deserve the demise with which they will likely be faced. So much is beyond our control, and all we can do is make educated judgements and take necessary precautions to minimize risk. Trust me when I tell you that few people back out without some very heavy weighing of the pros and cons. Maybe it is fortunate that the days are as long as they are because when it comes to this type of thinking, every minute is important. How’s that for sentimental waxing? Had enough? Yeah, me too. I’m done… Off my soapbox now. So, back to my “One Day in the Life of a Polar Addict” (sounds like a soap opera in the making, eh?). This is where I will get to the part which I described earlier as frightening. No, no, don’t worry, there were no polar bears harmed in the making of this story. But as I had written previously, today was my big day. A teensie bit bigger than I had planned on, but I can take a joke. So, as the North Wind began to flex its muscles once again at the crack of… wait, it’s pretty much 24-hour dawn at this point. Let’s just say, from the moment I cracked open my eyes, I threw one quick glance at all my equipment and said, “OK, what did I drag all of this gear and garb for if I’m not gonna test it to the limits? Off your bum, Ice Queen! Think dogs! 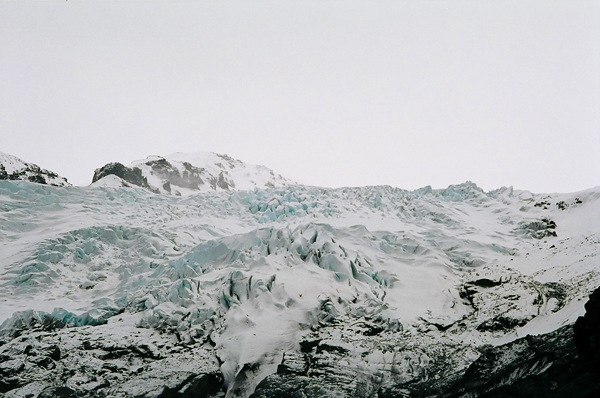 Think glaciers! Think ice caves!” Alrighty then. A nice cup o’ high-test (not that I need it around here), a slice of 37.5-grain bread and a thick slab of butter (mmm, buuuutteeer) & jam, a cookie (alright, two cookies), pockets laden with clean tissues, camera in bag, the heavy duty Michelin-man-esque clothing donned, a rifle on my shoulder, and I’m off. Yes, to all of those who are simply horrified at the mere premise of Moki carrying a rifle, listen up. I am not a gun proponent by any means, but I’m also not a proponent of being one of the entrees in a polar bear smorgasbord. Got that? Luckily, I’ve never had to shoot except for practice, and as soon as I am back, the weapon is out of sight AND mind. It is actually Svalbardian law that no one can leave the outskirts of town alone without one – or they get thrown in jail. There you are. A 2 kilometer hop and skip down the road to the Hundeshut (hounds hut) office. Uh, it was more like a broom closet, but who am I to judge? Then into the Land Rover and off to the cabins where the sleds and dogs are awaiting a decent day’s challenge. Road? Did YOU see a road? Well, it’s that flat bit of snow between the skinny orange sticks sticking out of the ground every 100 meters or so – which is, incidentally, identical to the flat expanse of snow on the outside of the skinny orange sticks sticking out of the ground. It’s not unlike coloring inside the lines with your crayon set. Color outside of the lines, and you wind up like that unfortunate bulldozer half-submerged in what is glacier run-off in the dead of summer – now frozen still. It’ll probably be there when Geraldo Rivera decides to run for the presidency. Notice how I’m purposely avoiding discussion about the 350mph winds which are making our vehicle feel more like a Cuisinart with every passing kilometer. Wind? I don’t see any wind, do you? Doesn’t snow typically fall horizontally? Come to think of it, I can’t even see the hood of the car. There are 3 other people with me, the driver who is also the guide and dog-sled company manager (newly relocated from Poland – of his own volition in case anyone is dying to know), and two older fellows from mainland Norway. It felt like the United Nations in many ways except for the itty-bitty hitch that the Norwegians did not speak Polish, nor much of English, and Mr. Dogsledski, not much English or Norwegian. I, being Ukrainian, could easily communicate with Jacek Svientohovski (his real name) because both are Slavic languages, but neither of us was much good with the two Scandinavian gentlemen. So they talked with each other, and Jacek and I discussed former Soviet regime politics. But, it was quite evident that the Norwegians were becoming somewhat anxious about this adventure. By the time we arrived at a bunch of huts which were half buried under the snow by now, there was no backing out for any of us. We were committed. In more ways than one. More like fit to be committed and institutionalized. 17 dogs at our disposal, two sleds. 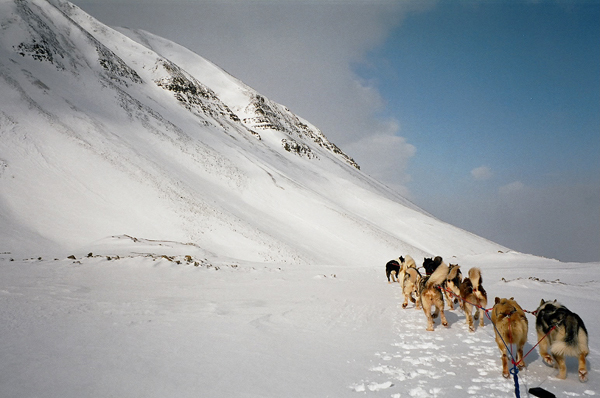 The Norwegians watched as Jacek and I harnessed the dogs, some not so mute malamutes, a few huskies, the rest mean ol’ Greenlandic expedition dogs. Whoah, these sure aren’t couch dogs; these sport shredded ears and other scars, but there’s no breed of dog that’ll work harder. However, I don’t know what the heck Jacek was thinking. He must have assumed that all of us were seasoned mushers because there was little instruction on how to use the brake, the anchor, the belts, etc. Had I not done some dog-sledding in Sweden’s Lapland a few years back, there is no way I would’ve been able to figure it out on my own. I felt sorry for the two men left completely in the dark, and not just because of the language barrier. But there’s no time to waste here. It is 19 kilometers to the mouth of the glacier which we will then need to crampon our way up just to get to the opening of the cave. “And what was that you said, Jacek? You want us to do all of this in 6 hours or less? No way, Jose… I mean, Jacek.” But, Moki’s game to try pretty much anything, and Jacek is ‘testing’ me. Boy, he doesn’t know me, does he? 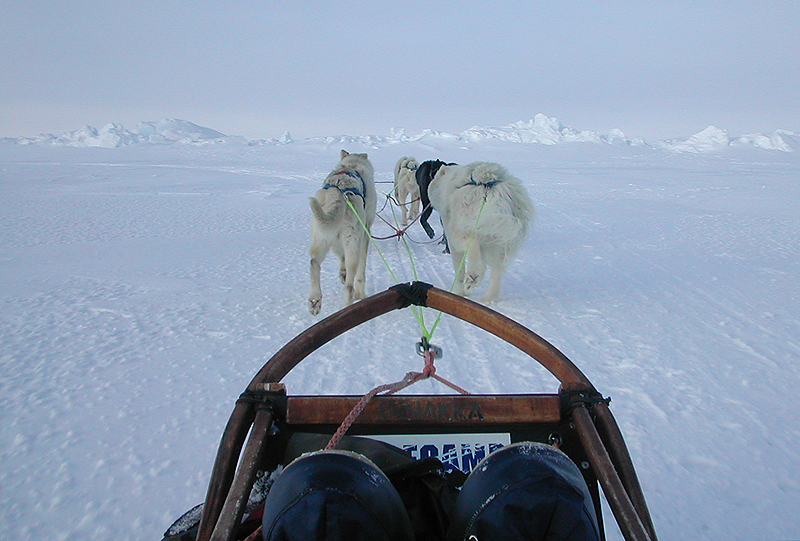 Before we knew it, I had one of the Norwegians inside my sled as a weight, Jacek had the other, and we were racing…. In the wind which had worked its way up to about 450 mph by this time (OK, I’m exaggerating slightly for a bit more spice). We turn into the void of the fjord, and suddenly the wind just stops! And it stops completely! It’s almost as if someone had turned the machines off. Now, we’re in blue sky with a few cotton-candy clouds, the snow a radioactive white…. Heaven on Earth, I say. Off with the furry hat! Unzip that jacket, and just feel the light breeze on your face as you shoosh along the squeaky snow… Ahhh…. and the smell of those darn ‘rocks’ again…. Mmm…..
…. and now for a brief intermission…. of mad-dash packing, attempting to stuff more than I came with into an already screaming for mercy duffle, a 1/2-hour nap, and back to that dang airstrip for a 3:45a flight. Yes, quarter to four in the morning – because this is the town that never sleeps, remember? You just take the first flight that becomes available because there are so few. I will continue my dog-sled story, and the part about the ice caves we never reached, once I get to Iceland (via Tromso and Oslo)…. Oy….. But I tell ya, folks, there ain’t no energy-producing vitamins like the Arctic air and aura. Have no fear, I shall be back with more drool-inducing (an assumption on my part, naturally) trivia. Well, I have to say, as much as I hate certain examples of technology, my new cell phone has served me well. It’s hard to fathom that not only do I get a signal all the way up on and near Svalbard, which is only 600 short miles south of the North Pole, but I can also Email photos! Of course, I Email them to my own laptop instead of sending them to each of you individually, and then I attach them to my dispatches. KOOL, huh? Anyway, here are a couple more pictures for you to see the ethereal beauty of where I am, but so that you can also witness the wrath of global warming. Such conditions don’t normally occur until mid or late May, and here we are just ending the second week of April, and many places are already impassable. And not that the depth would make much of a difference if you partook of an involuntary dunking, but keep in mind that the Arctic Ocean floor is about 14,000 ft below the area of the pole. That’s a pretty long way to sink…. Regardless, there is no denying that we’ve had a hand in climate changes, but since I don’t qualify to be the anti-fossil-fuel poster child myself, I won’t begin that lecture. So, where did we place the bookmark in my story? If memory serves, it was somewhere in the middle of my dog-sledding excursion chapter. Right?…and so this next episode continues where we left off with silent shooshing on squeaky snow toward some glacier in the far reaches of the Arctic in search of the origins of the color blue. We are about 3/4 of the way there, when suddenly Jacek brings his dogs to a screaming halt, and begins to pound the ground. Naturally, I must do the same but sans the ground-pounding. The dogs are no less confused than are the rest of us two-legged participants of this particular adventure. I anchor my sled and inch over to the Polish whirling dervish, and softly inquire about the reason for his sudden affliction. Well, it turns out that Jacek had left the whole duffle with our gear behind…. the duffle which had the crampons, ropes, axes, head-lamps, and… lunch. He knew we’d have to turn back, but we were about 2+ hours into the 3-hour drive, so to turn around now would give us only two choices: bag the rest of the excursion skipping the ice caves altogether, or going back to the kennels, unharnessing the dogs and coming back on snow-mobiles. I gotta tell you, it’s not easy having a meeting with people whom you can’t communicate with in a common language, but we somehow managed by drawing hieroglyphics in the snow. We opted for returning to camp, and to drive to the glacier on snow-scooters. Back to the dogs. The trip back was perfect, and way faster because it was down the mountain, meaning that there was no need to push the sled (gratefully), but I don’t think I took my foot off the brake at all. It’s really tough holding onto a sled pulled by 11 dogs, but I managed albeit not always in Baryshnikov fashion. I did fall off twice, performing my own rendition of that Wide World of Sports “Agony of Defeat” film-snippet of an unfortunate skier hurtling out of control off the ski-jump launch as onlookers inhaled through their clenched teeth. But nobody gets really hurt doing a faceplant in deep snow. More souvenirs, but these will heal. Then….. we round that bend, and what we see causes all of us to take in a good deep gulp of Arctic air. An oncoming storm, the likes of which I have never seen. It wasn’t quite as fast as an avalanche, but it sure resembled one. I took my last photos before I had to hide the cameras away. Within minutes we were in a white out! And I mean WHITE OUT! I’ve attached a photo of my dog-team just minutes before it hit, but in the midst of this white out, I could not see anything but the faint ghosts of the last pair’s tails!!!! Unreal….. And how do we know where the granite outcroppings are? Well, we don’t! The wind was howling INSIDE my parka hood, packing it full of snow even though it was pulled tight! And the dogs couldn’t hear my commands…. But because they were headed home, they weren’t about to stop. Jacek told me to simply trust them. “Uh…. but they’re DOGS, Jacek!! !” And then it dawned on me – yes, they are indeed dogs. If you can’t trust your own dogs, you can’t trust anyone. My eyelashes began to develop icicles, my exposed cheeks and nose taking the brunt of the snow needles blasting my skin at what had to have been a good 40 or 45 mph wind, not even adding to that our own velocity which was what felt like a speed approaching Mach 1. My much elder passenger was not handling this well, but he had little choice. None of us had much choice. If we stopped, we could sustain some serious damage. An hour more of such thrills and chills, and the dogs found home. I tell you, I don’t think I have EVER been more relieved in all my life! With the dogs unleashed and inside their pens, the humans huddled in a cabin lit with candles, the wind actually shaking the building. Ahhhhhhh…… a thermos of hot chocolate, which was probably the best hot cocoa I’ve ever tasted… Well, at that point, drinking warm curdled milk would’ve been fine. The Norwegian men sat and regained their composure while Jacek and I laughed at our misfortune, or was it really? He looked at me and asked if I’d go do it again. And what do you think my answer was? Now that we have our necessary ice-caving gear, I’m game to going back out. These dogs know way more than any of us do, so let’s go! But… the Norwegians shook their heads which meant that we all had to go back to town since there was only one car. Poor Jacek started to feel guilty that I had not seen the ice caves, and offered that I return the next day for a private tour, but I already had my flights all set up, so there was no way I could fit it in. And after dinner, I was to meet with Borge and the remaining members of the Last Degree team, who were, after all, the reason for my trip up here. I tried to set Jacek’s mind at ease as much as I could because he made an honest mistake in forgetting our equipment. The Norwegians weren’t quite as understanding and took half their money back, while I insisted that for the experience I received I wouldn’t take a kroner from him, especially since he is collecting them in order to continue with his veterinary studies. See, here was yet another reason why we had so much to talk about. I had told him of my wildlife rehabilitation license, of my skull and bone collection, and of the many dogs which had blessed my life, most of them wolfhounds. And just before we all packed up to leave and return to town, Jacek ran to his own cabin, and came back with a gift for me. How could I turn it down? I couldn’t. Nor did I want to. But, how the heck would I fit this massive reindeer antler into my duffle-bag? Well, it took about 2 hours of careful clothing origami, and putting my heavy-duty insulated gloves over the sharpest points, my boots over the large end. However, I will be amazed and astonished if my duffle returns to New York without at least some holes poked through it. But what a prize!!!! From one of my favorite places in the world. And from a newly made friend whom I am certain to visit again. Now, to end this chapter with something quite amusing, I must tell you how Jacek reprimands his occasionally misbehaving canines. I was told that his dogs are the best behaved on Svalbard. Why, you ask? Well, I needed to know myself. When I asked at the start of our excursion, he just laughed and told me that I might get to see for myself, as there’s usually at least one teeth-baring incident between the Greenlandic members of the canidae family. Well, sure enough, during the more serene chapter of our run a fight ensued over something as trivial as trespassed dog airspace, and Jacek bolted into action. He halted the dogs, anchored the sled, ran over to the one accused of the alleged crime, and then…. Jacek actually got on his knees and….. BIT THE DOG! Yes, he bit it so hard that the dog yelped from the pain, and rolled over submissively. While Jacek angrily walked back to the sled, he was taking hairs out of his teeth. I was a bit shocked, but hey, it makes sense. That’s what dogs understand best. That is canine discipline, and if Jacek wants to remain the alpha, he must punish the lower-statured ones via the same M.O. that an alpha dog would use, namely biting. I have to say, that turned out to be the one and only incident for the rest of the trip. And had I been asked to write an article about it, the headline would have read: “Man Bites Dog”. Have you ever gone to a new place only to discover that the place doesn’t really want you there? Well, it doesn’t happen to me often, however…. this might just be the one which shall be at the top of that short list. It’s ironic because of its name. 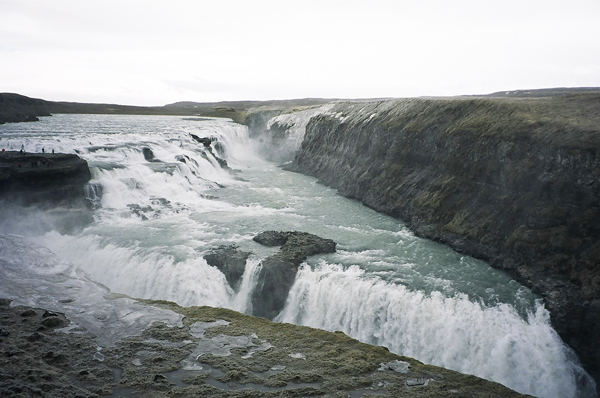 It’s ICELAND. What? But how is that possible? Any word containing the letters I, C, and E should be friendly to the Polar Princess, don’t you think? Alas….. ’tis not so. Allow me to explain. First I arrive at Keflavik airport, which is approximately a 20 minute drive from Reykjavik where my itty-bitty hotel is (some 45 kilometers or so), and it’s pouring rain. Not just a light shower, I’m talkin’ the second coming of the legendary Noah flood. However, I am not one to complain about the elements (except for HHH summer weather), so I’ll be fine. But as we are about to exit the plane, something appears to be wrong with the airport gate gangway, and they have to bring the rolling stairs – which means that…. I will be one wet kitty! Rain jacket? Um, it’s kinda like packed in my duffle, which is kinda like in the cargo space? So, you guessed it. Some welcome, Iceland! Gee, thanks! No sooner do I walk inside, that the sun comes out!!!!! That’s, apparently, normal for Iceland. They have a saying here that goes something like this: “If you don’t like the weather in Iceland, just wait an hour”. Oh, yeah? Well, I shall put that to the test…. Then it’s taxi time. A whole line of them just outside the terminal. I get into the first one, and am feeling lucky that the driver speaks English. I start asking questions about “things Iceland”, and he…. as immediately becomes evident, has no “off” switch. 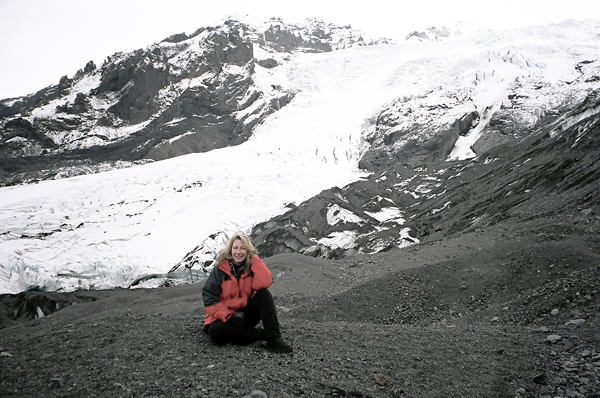 By the time I got to my hotel, I had enough information about Iceland to qualify for an honorary Master’s Degree on the subject…. “That’ll be 9000 ISK (Islandik Kroners).” I pay the nice (talkative) gentleman, and check in with hotel reception. While I’m waiting for my room key, I do the foreign exchange math. The amount hadn’t bothered me because it sounded right, by Norwegian Kroner standards. By Icelandic ones, I had just paid the nice talkative gentleman a whopping $130! Too late now… Moki’s been had for not paying attention. But just to assure myself, I ask the reception person what the typical cab fare for the airport to hotel should be, and she says it’s somewhere between 8500 and 9000. Alright, I haven’t been had afterall, but it’s now clear that we have a whole different ballgame here. A very EXPENSIVE ballgame. The hotel room is fine, albeit about the size of pizza box, but it’ll do. I never spend any time in my room anyway. The bed is also OK, but if I stretch out, my feet hang off the end, as do my elbows. For a brief moment, I thought I had walked into the House of the Seventh Dwarf. AND it is so hot in the room that I have to open the window! But it’s basically free heat because all of Iceland is heated with the natural steam lying beneath its volcanic crust surface. Oh, and I forgot to mention that there is a distinct odor of sulfur hanging in the air all through the countryside from the constant underground volcanic activity. So, back to the bed size, which again, would have been just fine IF…… I hadn’t fallen out of it about an hour after I fell asleep. And do you wanna know WHY I fell out of this lilliputian bed? Well, because ICELAND decided, in my honor I suppose, to have an earthquake! It was small, but it sure was plenty exciting to make me roll off onto the floor….. Darned lava (there had been a volcanic eruption somewhere offshore)! But once again, par for the course in Iceland…. Today, I booked myself on an all day mountain taxi tour, which was supposed to have been an “Iceland in a nutshell” type of excursion. All of the natural sites and phenomena, plus a dog-sled shoosh on the glacier (no, I have NOT had enough of the dog thing! And never you mind that I am so sore I can barely move…). But first, a bunch of waterfalls. And wow! What waterfalls… The only problem was the breeze. A literally 80 kph BREEZE…. which caused the waterfalls to flow…. horizontally, bedeckling all of us brave enough to venture close to them with a crispy crust of ice. Hmmm. ICE-land, eh? OooOOOoh, I get it now… The teeth of the three twenty-something young women also with me for this tour are chattering loudly as the three ladies run back to our monster truck vehicle which resembled a small building on B-52 wheels. I tell you, I’d love to have one of those trucks if for no other reason than to be able to drive over the tops of all of the other cars stuck in rush-hour traffic on the FDR in New York city! You would not have believed what that thing went over! Even I, who is not easily impressed, definitively was. Anyway, the driver, who no doubt was guffawing to himself sitting in this mountain truck while the stupid tourists were out experiencing typical Icelandic “weather”, gave us the rundown of the itinerary for the rest of the day. All the while, from the time we left city limits, my eyes were trained on the mountain tops. I know my mountains, as I know my mountain weather. I don’t want to be an alarmist, so I kept quiet. But as the conditions got more apparent, I felt obligated to point it out. I asked our guide/driver if he was sure we’d be doing the dog-sledding on the glacier as I gently gestured toward the peaks, which by now were mimicking Everest in a cranky mood. There was such wind up there in these ICE-landic mountains that in my own mind, I was convinced that there was no way that we wouldn’t get a free yet involuntary flying lesson, never to be heard from again. This was no joke. 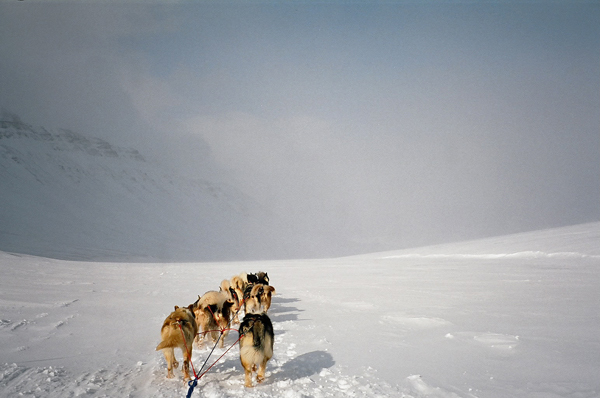 Our driver insisted that the dog-sled guy typically goes out in pretty much any kind of weather…. Well, okie-dokie, who am I to say? It looked like 60-70mph winds to me, but hey, maybe we’d be sledding in some protected glacier valley. 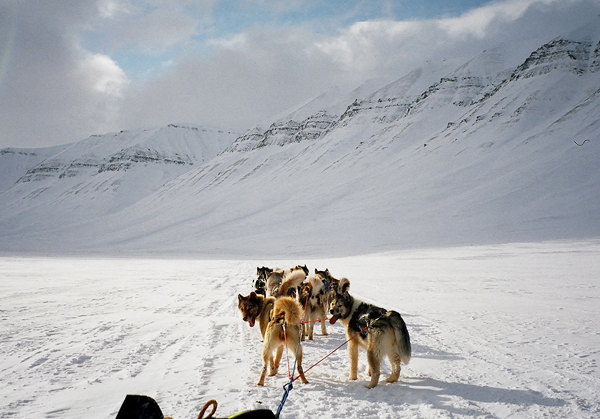 When we stopped for lunch, the driver received a call from the dog-sled contractor. Yup, you guessed it. Cancelled, because all the sleds literally blew away (yes, really), as would have the dogs huddling in their doghouses had their houses not been chained to the ground!!!! The man had clocked the wind to be 130 kph! I was right…. ICE-land. So, what was that saying about Icelandic weather? It’s a lie!!! Because the wind machine never turned itself off. It got windier and colder, and by the time we got to the geyser, nobody but wacko, cold-lover, yours truly here got out of the truck to go look at it. Honestly, though, I really had great difficulty standing upright. But it was well worth the trudge-against-the-harsh-elements to have the sheer delight of getting soaked by putrid sulfuric steam… ICELAND! Our driver was feeling very badly about the fact that we couldn’t do what we had signed up for, so he offered to take us to a different glacier, after a stop at yet another waterfall, which he insisted experiences less wind due to a more protected location. But….. it’s another 2 hours further. Whatever. We all vote “yes”. 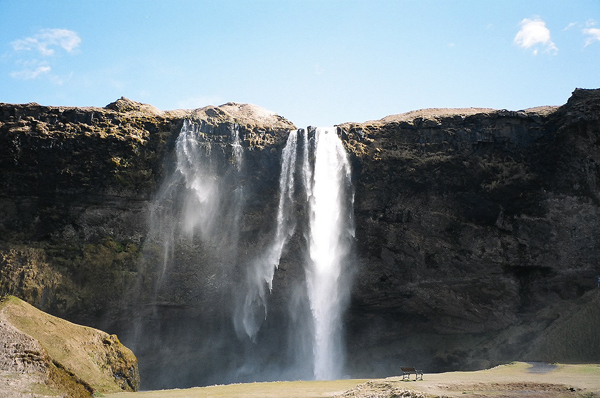 Skogafoss first (that’s the waterfall). Well, I am not often speechless, but this waterfall…. well….. you’ll see the photo at the end. No explanations necessary…..
By then, back on the “road”, the wind was whipping the truck around pretty good, but our driver is a very determined fellow, so we continued on. 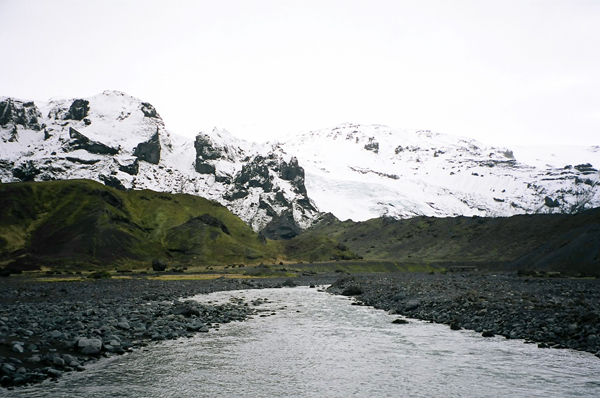 He turned deeper into the mountain range, and we were soon facing a raging river. The rest of us figure, oh well, time to head back, but before we knew it, this dude had the truck halfway across it, driving in what had to have been a good 5 feet of churning foaming water! AAARRRRGH!!!!!!!! But hey… No prob. I offered our driver an inquisitive glance, and from him, came that line I had heard a few times before: “It’s all in a day’s work”. I tell ya, most of us in the States must hold very boring jobs if this is all in a day’s work elsewhere…. About 6 or 7 more river crossings, with bouldered grassy expanses in-between made us all feel as if we were on that amusement ride I like to call the “Happy-Go-Pukey”. 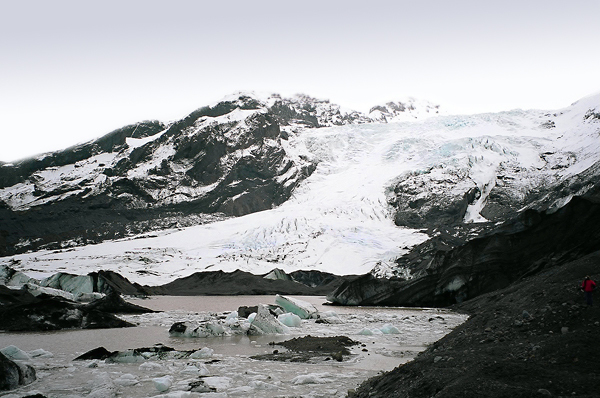 But in the end, we found ourselves at the tongue of the glacier…. Ahhhhhh……… Wind? What wind? I no longer felt anything. I spotted that perfect turquoise streak poking through the white snow, and I was in paradise. I sling-shot myself out of the truck and bolted up that mountain. The 3 ladies-in-waiting looked at each other, shrugged, stopped waiting, and decided to follow (yes, the driver sat in the truck – laughing loudly, I’m sure. And he gets paid for this?). Well, OK, maybe the day isn’t all bad…. On the way back to our respective hotels, the guide made one more stop, but I was the only one to get out and walk to the bottom of this canyon. I mean, c’mon, ladies and gents, I ask you, which of you could resist being able to have one foot in Europe and the other in America (while still alive, of course)? See, Iceland lies directly on the Atlantic Ridge rift which separates the American from the European continental shelf. 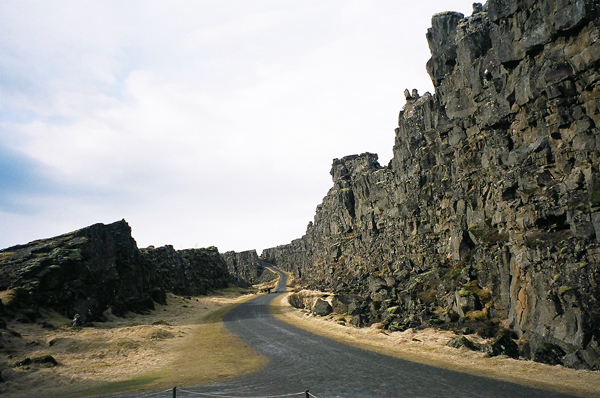 At the split, which is above sea-level here in Iceland, the European plate continuously moves away from the American by about an inch a year. 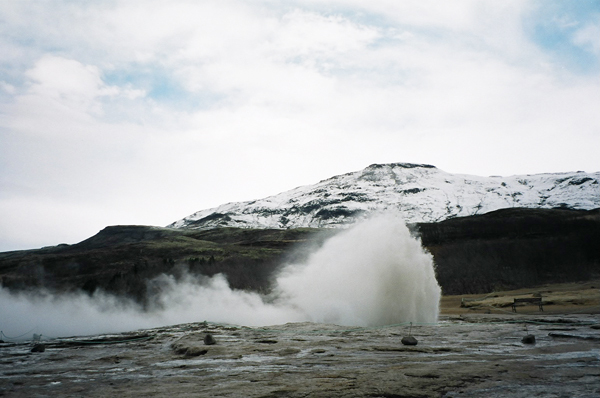 This is from whence Iceland came to exist, and from where all the volcanic geothermal activity comes. This is where the epicenter of the earthquake was as well. The newly created land between the two sides is called no-man’s land. So, naturally, as would be obvious to all of you who know me well, I had to try to stand with one leg here, the other there, as well as to stand in no-man’s land (no particular reference to gender here at all). So I find all of this geology/geography stuff really kool. So what!?!? Sue me! Such places are the ones from where I collect my rocks. What better souvenirs to have than from no-man’s land? It’s all in a day’s work………..
Well, game’s just about over, folks. This afternoon, I return stateside. Reluctantly so…. It’s been great for the most part, with few misgivings, and with hopes to return as soon as time and greenbacks allow. To those of you who have faithfully followed in my footsteps (from your comfy chairs), I thank you for your time and concerns and worries, good wishes and warm responses. To the school kids who’ve also been reading these dispatches as a daily treat (and hopefully inspiration of some kind) if you will, I hope that you’ve learned a tidbit or two. As Michelangelo said: I never stop learning. I, myself, live by the same motto. No matter what you are doing or living, good or bad, there is always a lesson in the experience. 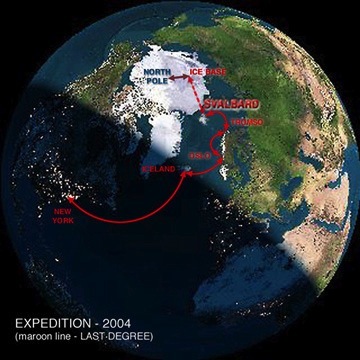 The most important thing that I have learned in recent years, these expeditions definitely having the biggest impact, is that there is very little in this world which we as individuals cannot accomplish IF we set our sights and work hard to reach those goals. Were it not for my undying hopes and steadfast tenacity, I would never have believed that I would one day set foot on THE geographic North Pole. Another lesson learned is that we also have to allow for eventualities and unforeseen circumstances which can and will, on occasion, change our master plan – but we should not allow those set-backs to pull the rug out from under our feet. There is always a solution, a way to get around it. Go with the flow. The moral of the story here is: focus, focus, focus. And just because conditions and my own restrictions forced me to choose not to join Borge this year, it does in no way mean that I will never have another opportunity. There is undeniably tremendous disappointment, but there also is that focus toward another chance. I pay my gray hairs no mind. The pangs and discomforts of arthritic bones won’t stop me either. When I am out there on the Ice, on MY Ice, in my own paradise (parad-ice), I feel no pain. There is only beauty. There is a serene and spiritual awakening in that deafening silence. As I have dubbed it, this is polar nirvana. I return with renewed hope, with a new energy from which I shall draw my strength for as long as I can. And…. I will try again. I am already first on Borge’s list for his next one. That will give me time to train properly, and get into the best condition of my life. This time, I wasn’t nearly as prepared as perhaps I should’ve been, and the fact that the conditions in the Arctic this year are as severe as they are, was a message from my polar gods. I have learned to listen to them, and to… go with the flow (or as the case here may be, to go with the ice floe). Many of those who are “professional expeditioners” such as Borge and Ben and Marcus, plan out their challenges years in advance, and not just 3 months as I had done. I found out about Borge’s Last Degree expedition only in mid December – which truthfully was not enough time for me to prepare as I should. Borge insisted that I could still manage, but I was apprehensive at best although I wanted to do it so much that my teeth hurt. There were ‘yes’ days, there were ‘no’ days, and in the end, it came to be that my decision had to be the ‘no’…. But that’s ONLY for this year, for season 2004. It is NOT forevermore. So…… I WILL be back! And now, after having met with and connected with Borge on a metaphysical level, there is no way that he himself will let me back out now. 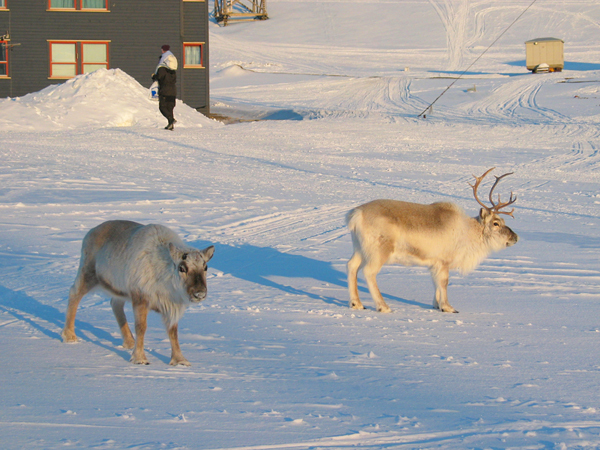 We talked for hours, and he seems to be more than positive that I have the right stuff… The right POLAR stuff. I have what it takes to take on such a challenge and more. I can’t even begin to figure out why he was so adamant, but he’s the expert, and…. I will go with his flow. Because of my skeptical nature, I place my trust in very few people as a rule, but here we have someone whom I’ve admired and worshipped for years now, who, after meeting lil’ ol’ insignificant me, was himself inspired by MY words…. 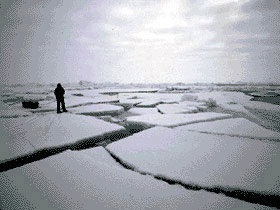 by MY feelings of closeness to the Ice. He and I, as most of us who come this far North, feel a reverence for this realm. This is our shrine. This is a religion of sorts. Yet, it has no specific rules, no boundaries. Each of us has true and deep feelings and a connection with this surreal world just as the Inuit has for the aurora borealis, or for the seasons of light and darkness. Everything here is ethereal. I feel beyond fortunate and beyond lucky to have found my center. It is here, at degree 90 or as close to it as I can get. And joking aside, I honestly took my friend, Joanne’s, words as a compliment. Yes, I really do have proverbial ice running through my veins. I am not a cold person by any means, but the ice crystals in my heart are what give it its heat. The Ice makes my heart beat stronger…. The Ice stokes its fire. Here, standing alone – I am whole. The next time I see Borge, I will be compelled to genuflect to him for his words of encouragement to me. There have been few people who have given me what he has…. He is, unequivocally, THE man! And now, also a friend. How lucky could I get? Huh? Next, the focus now is Last Degree 2006. (Borge is not guiding it next year because he has planned yet another personal challenge and endeavour for himself. Go, Borge!) But…. 2006 will also be the year I reach the big “five-oh”. When I turned 40, I chose to climb to the summit of Mt. Parnassos, so in the year that I turn 50, I ask you, what better way to celebrate that benchmark than with a week on the Ice alongside Borge and his 2006 team? See? It might have been for the best that I didn’t go this year afterall….. What’s a mere 60 miles out on the open Ice at the tender age of 50, huh? Piece o’cake! As Steven Wright says: “Everywhere is walking distance if you have the time”. Heck, yeah! 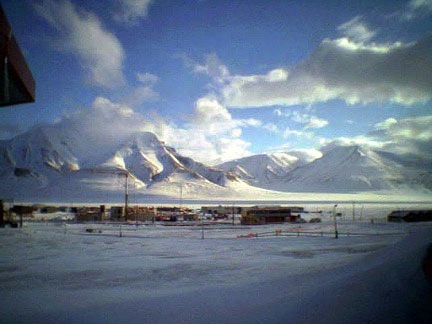 I will hopefully be back on Svalbard next April, to race yet again with Jacek on that dog-sled to the ice cave! What a bunch of friends I’ve got, eh? Just a bit out of the ordinary, I’d say… And for a little comic relief here as well, in Greenland there is a saying: “God forgives priests and dog-mushers if they are cursing.” I intend to put that to the test (the musher part, anyway)…..
Who me? Happy? Naaaah….. I was just being polite to Borge (see below). Uhuh, suuUUUuuuUUuure. And now, if any of you would like to purchase ocean-front property in Oklahoma….. I got my pictures today!!!! If anyone is interested in seeing a few more from my travels, put your name on the list and come on over! Ah, if only I could turn the clock back one week…….. and then stop it…..